mushroom-white complexion. Poor little boy. and started absently picking through a pile of release forms. momentarily, then turned back to shuffling the release forms. Lila hung up her long leather duster, tossed her bag in a locker, put on a pair of earmuffs and her amber shooting glasses and walked down the line to station two. No gunfire, but a high-pitched laugh came from the small space between the bullet-proof dividers. Lila’s Teju lizard cowboy boots clomped on the cement floor as she came up behind the firing point. allowed normal sounds through. The woman, Gwen, was holding a small pistol, and Lila noted how she automatically thumbed the safety on and brought the muzzle down and away. Practiced control. Lila held out her open palm. 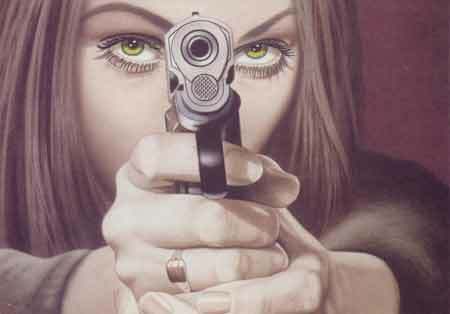 Gwen easily shifted the Beretta to her left hand and shook. Lila looked down at Gwen’s hand. Firm grip. No rings. No fingernail polish. Gwen was shorter than Lila, and a little thinner. Tight, compact figure. She looked older than Lila though, maybe thirty-five. Blonde, of course, with a short pageboy cut, shorter even than Lila’s. half-serious salute, and stepped out of the station. instructors. Definitely not many cute ones.” Gwen turned to the target, and started firing. Round after round after round after round. All bull’s-eyes. Stephen Dorneman is an occasional MFA student, occasional marketing analysis consultant, and once in a while even a professional poker player, with an MBA from Northeastern University and a BS in Biology from Penn State. Obviously he has no idea as to what he wants to do when he grows up, other than write. He is currently living in Boston with his lovely and supportive wife Penny, and workshops his writing at Boston's Grub Street writer's collective and with the Bay State Scribblers, a renegade writer's group that mixes well with alcohol. His short story "Woman Alone: Self Portrait" will be appearing in the Fall 2006 issue of Diddledog.